A woman commented on an earlier blog post here, and it sounded like she somehow knew Ami, but I couldn’t tell for sure from her comment. She left a number and I just had a feeling I should call her. So I did. Her name is Jackie, 73, and she’s the one who originally rescued Amicus from Abbotsford Animal Control so many years ago. She said she fell in love with him and knew he was a very special dog. She said she cried over him so often because he had just given up at the Abbotsford pound, he lay on cold concrete, they overfed him, there was poo and pee everywhere, and she said one day he just wouldn’t get up, he’d totally given up, she said. She lost sleep over him and did everything in her power to eventually be able to take him in her van (along with about five other dogs she was also rescuing) all the way over to the SPCA on the Island. She said she loved him so much. Thank you, Jackie, from the very bottom depths of my heart for rescuing A.J., as he then was, and for saving him for me so he could become Amicus Black and I could be his happy forever home. He’s the best thing that ever happened to me and I love him completely. Without you and your rescue efforts, he’d probably be dead long ago. I can’t begin to thank you enough on his behalf and all the other dogs you’ve rescued. I’m so glad I phoned you and again thank you so much. Posted in Amicus, Andrea Layne Black, Animals, Dogs, German Shepherd, Pets, Powell River, Shelter Dogs, Uncategorized, Valentine Mountain and tagged heros. Bookmark the permalink. He got into my car and slipped within my soul. soothing embers powering my heart, making me grin. handing over your heart completely. No matter how wrong I am, he is on my side. His brown eyes tell me paragraphs in seconds. We know each other’s thoughts before we think them. We play together as children unabashedly. my dog is my light, my reason. He is Amicus and he truly is the best friend I have ever had. 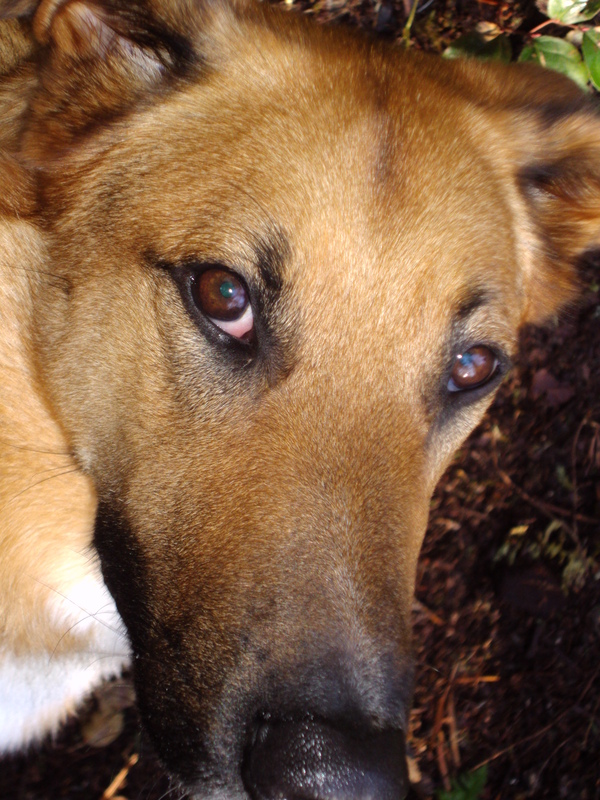 Posted in Amicus, Animals, Dogs, German Shepherd, Pets, Powell River, Shelter Dogs, Uncategorized, Valentine Mountain. Bookmark the permalink. Before Empires, wars, and European colonists stealing land from indigenous peoples and the ensuing enslavement, torture, marginalizing, discriminating, and exploiting, we humans as an evolving species stole land and life from the animals as we ventured further and further in their wilds slaughtering and enslaving by the trillions and this has only increased over the centuries with billions of animals being caged in tortuous situations, being bred as food, and dying in pain and horror, or being made slaves and the rationalizations, justifications, and arguments for this sort of treatment holding sway over pretty much the entire planet to this day. It is so easy to say humans are better than animals and therefore we can treat them anyway we want, but there’s such a crushing lack of empathy into the feelings of animals with that argument that, again, it’s so easy to also murder and dehumanize each other by that same logic. The easily-dismissed truth of all the species of animals that no longer exist or the ones severely endangered due to the activities of humans, the shocking reason we have organizations like the SPCA; not to mention our further daily encroaching (settling?) into wild habitats where predators are simply shot and nests destroyed, and entire ecosystems terminated, mostly to strip areas of their resources and/or the harvesting of animals. and to build homes and businesses for humans when other areas could be utilized. If we really want to change the way we operate we have to go back to the very, very beginning and re-examine our relationship with the most vulnerable on the planet, that being the animals who were here before us. Humans have had this concept of dominion and superiority over the earth and that all it contains is ours for the taking. I disagree. The earth is sacred and her inhabitants all have their own lives, needs, families, friends, and goals and we need to think about being together and not above. Even considering animals as property is a slippery slope because property has few rights. And those with no rights are fodder. Empathy means understanding the feelings of others, their love, excitement, playfulness, fear, and pain. Animals are others, the Great Others. They’re not little stores filled with things for us to use. Their homes/lands are not just ours for the taking because we’re more powerful. They should not be victims of our cruelty and greed. They deserve our respect and protection. I certainly don’t have all the answers as to how to implement this understanding, but I think it’s an issue that needs to be looked at in a completely different way than has historically been the case. I really do believe that life is sacred, all lives, and the living of life, as well. Animals must be allowed to have their full lives. I’ve pretty much felt this way since I was about five or six. I trust that little five-year-old Andrea on a very instinctual level to know what is the good and right thing, especially when it comes to animals because I have always found them to be amazing teachers, friends, and personal heroes. That’s my blog and I’m sticking to it. 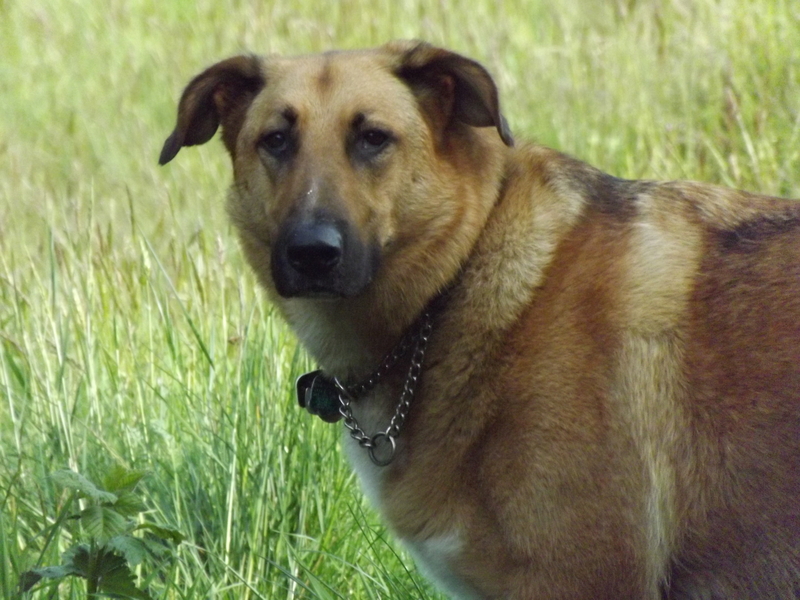 Posted in Animals, Dogs, German Shepherd, Pets, Powell River, Shelter Dogs, Uncategorized, Valentine Mountain. Bookmark the permalink. I am just blogging to say that I want to start blogging every day if I can even if I have little to say. I just want to get into the habit of it, and the training of it. Otherwise I get too focused on outcome and trying to be perfect which clearly I will never be, nor my houndie hound, but we are very diligent and strong and so I want to just sometimes throw things out there without a huge degree of thought and polishing and all that bother. Other things I did in this broken ankle time was I entered a poetry slam which I’ve never done and I did really well. I was super nervous beforehand, but the people there were so supportive and warm and the other poets so amazing and visionary. One guy, Daun Pechawis, I think is like a force of nature, an elemental spirit, I was so impressed with him and how he revealed his heart through such solid writing. I met a lot of people that night and I really felt like I was part of something, the community. I also discovered during my broken ankle period that I sure do love hot baths and boy did I miss them. The first day the cast came off, like 25 minutes later I was sitting in hot water staring at the poor shrunken scaly little leg that now needed love and work. But boy that hot water soaking into my soul felt good. It would be about two more months after that before I could get back to the forest. I did realize however that the forest was always inside me, like that poem I wrote a while back, “When the forest gets inside us, it stays there,” well that’s true. It’s funny now when I walk on a forest path I barely limp, but coming out onto a sidewalk or a parking lot, I limp again. That’s partly what I meant about the forest forgiving me. I also meant that only something alive is capable of forgiving and the forest is alive. I also went to a drumming singing session at Sliammon which is the First Nation that actually owns all this stolen land around here. I went there just to acknowledge that I know that; it felt really important to me. I was nervous and I don’t know how I sounded, but the people I met that night were very welcoming to me, and I am going to go back and sing more. There was a competition song where the men would sing and then the women would sing back. It was super fun. In the last few verses, I let my voice go. I felt awkward and nervous at first because I hoped I had said the right things and that it made sense. They were planning a canoe voyage where all different Bands meet up and have a big celebration. It sounded like such an amazing journey and it made me feel sad because I don’t have that kind of beautiful culture where families go on big adventures and meet up with their strong amazing communities. And when we were all singing, I wanted to go out into the forest nearby and listen from a few 100 metres away and feel like it was hundreds of years ago, and I was one of the first visitors and I would honour the powerful people I met and if they wanted we would have done things all so differently with strong friendly respectful nations glorying in the land and the magical beauty and the whole next hundreds of years would be different, but I knew I couldn’t do that and that everything is so broken and wrong, and so, again, it was weird, ’cause I felt sad and happy at the same time, sad because of the ways things are, and happy because I was singing with really friendly people and having fun. It was weird to have all those same feelings at the same time. And I thought if I were them, these welcoming people I was singing with, that I would hate me and not want me there, and maybe they did feel a little of that inside, and understandably, but the way they made me feel was welcome and special and I just kept thinking, wow, way back when it could have all been so so different and beautiful and magical and it was all done so so wrongly and it is still is. But I really liked singing those old songs and hearing the drums, and now I know it’s even more true than I thought, when the forest gets inside us, it does stay there, and also that the forest will forgive me, but the concrete never can, metal signs say nothing, but ravens chant sublime. Don’t know if all that goes together, don’t care. Well, that’s it for today, this is me just throwing stuff out there. Wow, last time I blogged it was March 23, about three months ago, and here I was hoping to blog every day and develop a huge following and be popular and loved. Well, three readers, obviously I haven’t blogged every day and have not developed a huge following, but I do have the most important friend perhaps I’ve ever had, the most perfect companion and faithful hound who would follow me into hell, even though he’s destined for heaven, if such places there be. I remember before I found Amicus, but I knew I wanted to get a dog, I would be walking alone in the forest and sometimes I would yell out “Amicus! 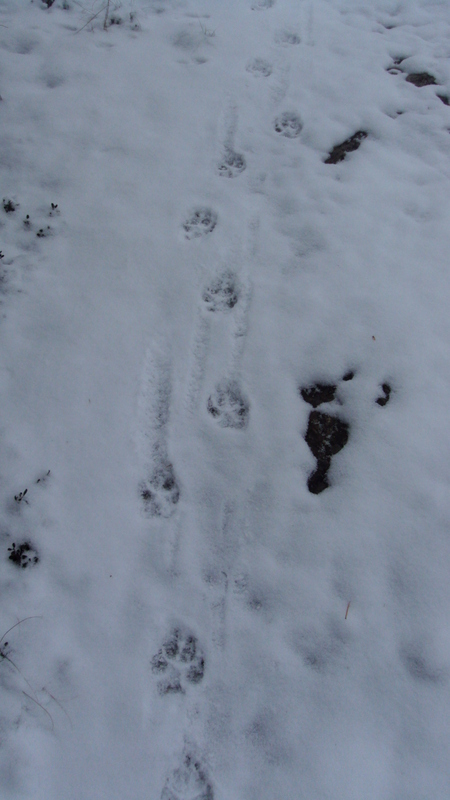 Amicus!” as though I had a dog who would come trotting through the bushes when I called. I called it out to see how it would sound and to imagine outcomes, I called it out to tell the universe that I needed a dog right quick, and I called it out so that whoever Amicus would be would hear it and hurry up finding me. I figured if anyone else in the forest heard me they’d just figure I was someone with a dog, that no one would hear some woman calling “Amicus” out loud and guess that she was yelling to the universe and yelling to an unknown entity who she wanted desperately to meet. I think back to those days when I was all alone, not lonely, really, or at least I didn’t know I was, I suppose. You don’t know you’re lonely sometimes, I think, until you’re not anymore, until your big empties are filled with dog love. Hard to explain, but anyone with a dog knows what I mean, I think. Anyhow, now when I’m in the forest and call out Amicus, I hear paws a-thunderin’, sometimes hear a-barkin’, I see brown and tan fur come a-chargin’, I see a wonderful bushy tail a-waggin’, a happy dog tongue a-lollin’, and when I call out Amicus now, Amicus himself comes a-runnin’. And that’s what I’ve been doing for three months since I last wrote, three intense beautiful months, exploring mountains, forests, lakes, beaches, and the whole of this little town I live in, exploring it with Amicus, a better friend you couldn’t find, fun, brave, stalwart, generous, and smart. When I call out Amicus now, I know I’m not alone and if anyone does hear me calling out, they better look out ’cause Amicus is out there running back to me, and he’s in a hurry. Now, when I call out Amicus, loves comes running to me, love comes crashing through the trees right to me. So maybe I’ll blog tomorrow or maybe it’ll be another three months, but right now me and Ami, we got important stuff to do. Amicus! Amicus! Come on, boy, let’s go! When the forest gets inside us, it stays there; parched ribs refreshed drip green moss; weary hearts newly beat plush strong rhythms, a mysterious geomancy of the mind; not just a walk with my dog, but a significant journey of two brave explorers amidst ancient cedar, fir, arbutus, raven, dark earth, and lichen; paw prints through mud under eager wagging tail, my awed plume of breath on the cool silent air, and his playful breath, too, with lolling happy dog tongue; there is a sacred hush amidst the towering trees where old delighted gods beckon us with cracked branch fingers, grey bark smiles, and on and on we walk and smile back because when the forest gets inside us, it stays there.